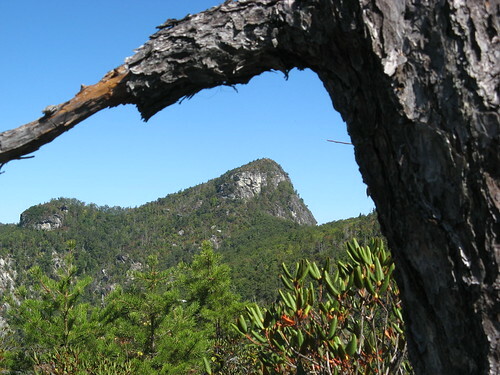 This is a can’t-miss hike if the weather cooperates. 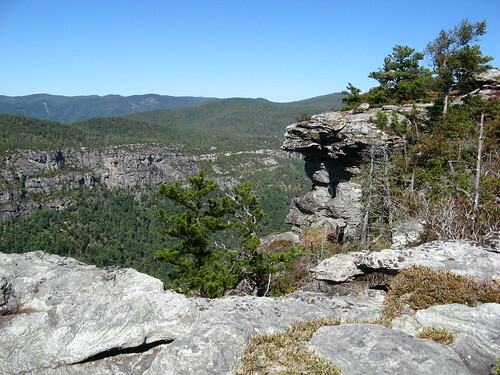 Table Rock, the stone uplift that forms the Linville Gorge’s most prominent peak, has amazing vistas at the top. 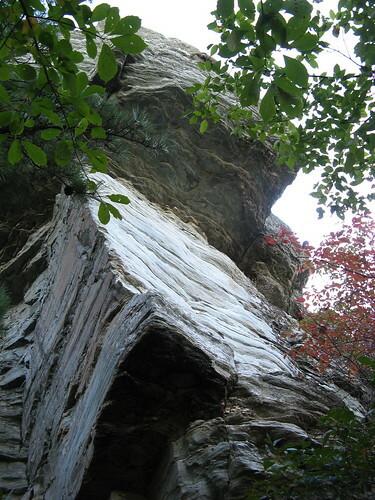 About a mile and a half south, the Mountains to Sea Trail skirts the ragged ridge of The Chimneys, one of the most impressive assortments of rock formations in a gorge full of them. 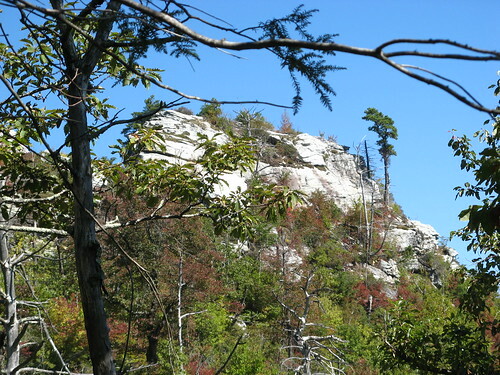 Starting at the Table Rock picnic area, I hiked to Table Rock Summit first, then backtracked and headed down to The Chimneys, then took a little detour down an unofficial trail to the eastern rim of the gorge. I put in about four miles; you could do a lot more, but you’d be walking away from the most compelling reasons to be there. Bear in mind that Table Rock’s picnic area is a popular tourist destination; gawkers can clog the trails (and fill the parking lot). 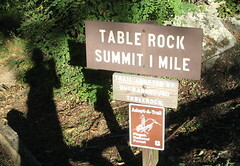 You can’t avoid them at the the top of Table Rock, but the summit area is big enough to support lots of people. Few venture more than a half-mile south toward The Chimneys — once you pass their grazing range you should have much of the place to yourself. About a quarter-mile up the trail, this impressive stand of angled stone looms over the Mountains to Sea Trail. Fall color is coming in, one splish and splash at a time. The hike to the summit is just under a mile. At about a half-mile, there’s a trail junction with the left turn heading downhill and the right going up. Bear right and keep going. As long as you’re heading uphill you’re going the right way. Here’s one of the views from the top. Here’s one looking southward. There are plenty of nooks and crannies to explore — just mind your footing; it’s a long way to the bottom. Looking out from a rock overhang on the way back down. When you get back to the parking lot, walk to the far end and get back on the Mountains to Sea Trail. 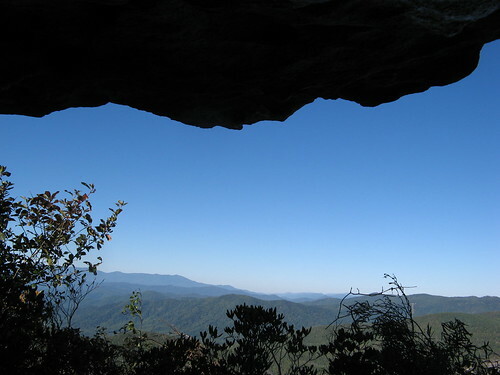 You’ll pass through a picnic area and a few campsites; not far from there, a big overlook appears over to the left. Here’s the view from that overlook. This section of trail is a bit faint and overgrown, but it can be followed if you pay close attention. This is another of those “best explored with a GPS unit” paths. 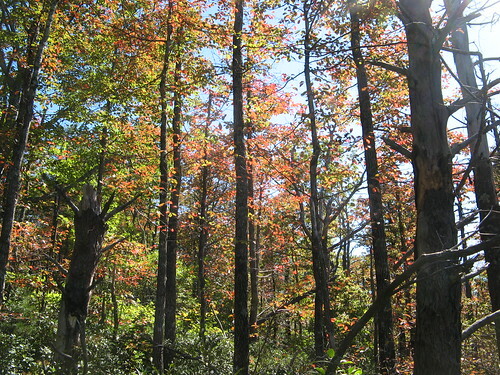 One very cool thing about this section of the forest: it’s dominated by one of the trees that’s already turning color. More trees near the east rim of the gorge. This was my view when I broke for lunch. 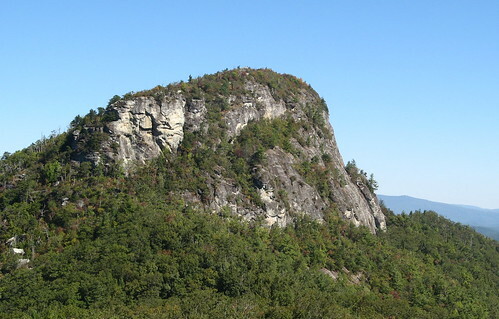 Another view of Table Rock from near the east rim. Warning for those thinking of exploring the east rim section: the edge of this area is a series of sheer cliffs plunging several hundred feet into the depths of the gorge. Visually spectacular, but fatal if you fall. The trails are very faint, if visible at all. This page at Linvillegorge.net links to all the site’s GPS tracks; best to stick to the main trails if you don’t have a GPS unit. From the east rim area, I found an even fainter trail back up to the Mountains to Sea Trail and headed back to the parking lot. My favorite dead-tree shot along the way back. 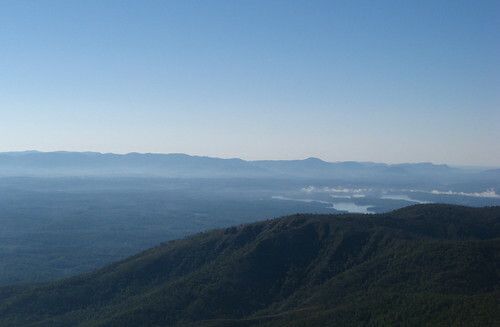 My best advice for this hike: wait for optimum weather — clear skis, light breezes, mild warmth. This is a visual route; no point going when fog socks in the canyon or gale-force winds make you fear for your life. 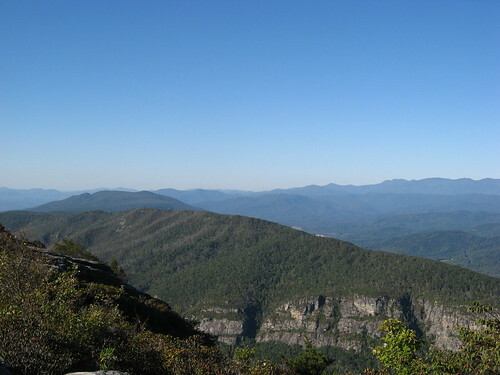 My previous Linville Gorge hikes. 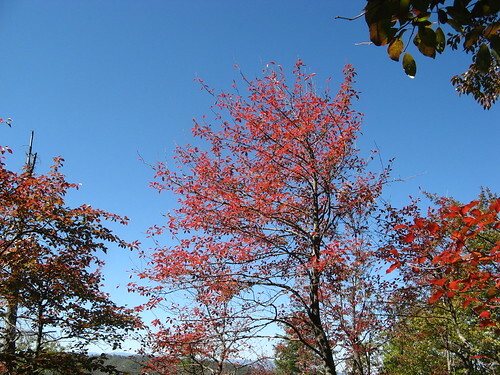 Great pictures from the summits and the fall colored foliage. I am not sure I understood why the burnt trees were there. Was there a recent fire in the area or is that something specific that happens in that area? There have been some fires in this area — despite the lush greenery the environment of the gorge is fairly dry in some areas and prone to wildfires. There’s another area down the gorge a ways that has pretty severe fire damage that nature is gradually repairing. I think most of the dead trees I photographed, though, died of old age or the various diseases or infestations that afflict certain species. Nice picture, and write up.. 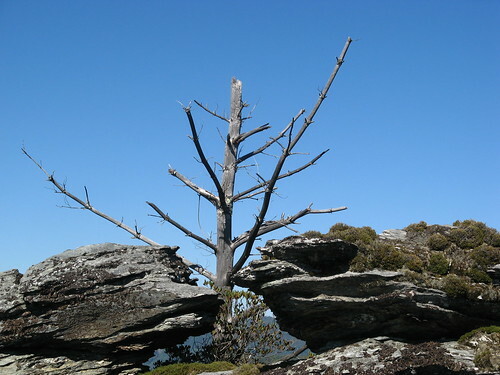 I am just discovering the Linville Gorge and all it has to offer. Your list of places you have hiked is also impressive. Your posts on Everytrail have given me some good ideas on new hikes. I am very thankful. Great pics and nice trip report. My husband and I were down toward the Chimneys this weekend also. We spent the night right above the Ampitheater and the weather was awesome. Stayed most of the day Sunday and watched our son do alittle rock climbing. Nice weekend in the gorge. Thanks for the post. Enjoyed the report – looks like a great place for rock climbing on east rim. 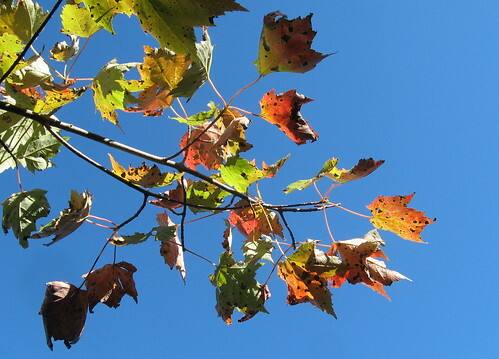 I’m also surprised to see the leaves changing colors at that elevation. Thought you would have to go to 4,000-5,000 ft to see them at this time of the year. Your post is unbeliveably beautiful with your description and the pictures. You really create a wonderlust in a person. I really have the desire to get out there myself and experience some of this, but as I have three children and am a full-time student, I just don’t think that I can manage it now. I’ve lived before in some really great areas for hiking. I used to go quite often then. Right now, I would have to go a good distance from home to find a good place to go hiking and exploring. I hope some day to inspire this in my children too. For now I will enjoy your hikes and when I can, I will venture out myself. 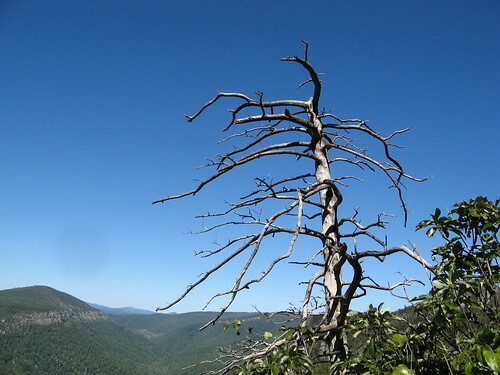 In 2006 a major lightning-started fire burned about 1700 acres on Shortoff Mountain, south of the Chimneys. It burned the soil down to mineral dirt. But nature is reclaiming the area, as she does. Many green plants are again growing. Tom, Great post! My buddy & I are headed to Table Rock this weekend. Our plan is to walk where you did, but then continue on down the MST into the gorge and out the other side. This is very helpful. Love Linville Gorge.